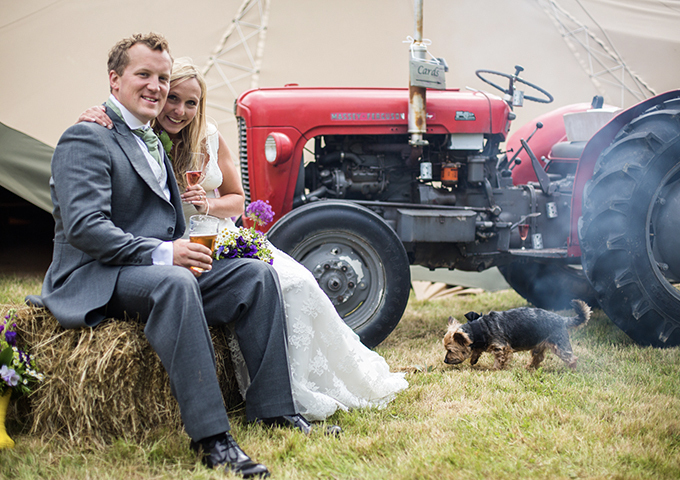 We knew when planning our wedding that we wanted to escape somewhere in the UK for a short mini break to recover, relax and rejuvenate after the big day. 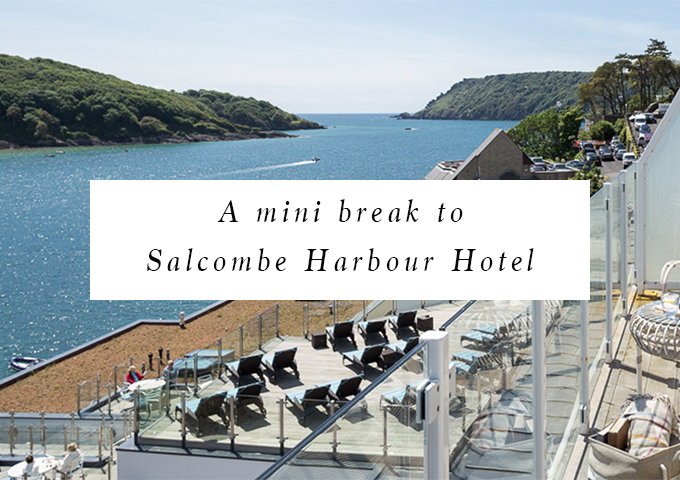 I longed to head back to Salcombe, a beautiful little town on an estuary in Devon and I knew that we had to return to one of my favourite hotels. 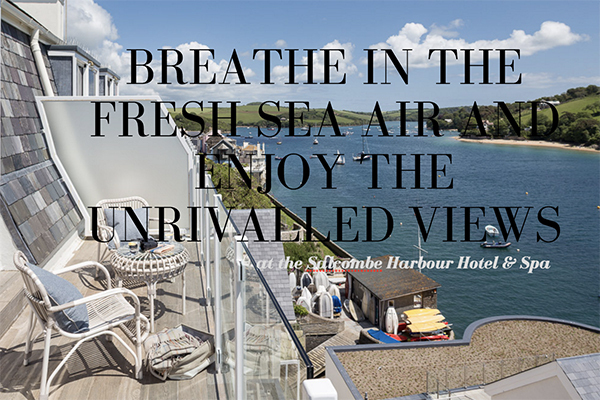 The Salcombe Harbour Hotel has a fabulously friendly feel to it. A place where you feel immediately relaxed on entering. If we were in America it would feel like a country club, I guess here as it’s on the estuary, it feels like a yacht club. You have a complimentary welcome drink during your stay, it doesn’t have to be taken immediately on arrival which is nice. We drive down the slope (a warning Salcombe is quite hilly!) and leave the car on the turning circle, our keys are deposited and our car is parked for us. We enter the reception area to be greeted by a roaring fire, for June it is somewhat needed. The nautical theme of the hotel is present already in the reception area. We had paid ahead of arrival so it’s nice that there isn’t a lengthy signing in process, we are shown to our room quickly and helped with our luggage. The hotel’s main accommodation is over three floors hosting over 50 bedrooms. There are also ground floor and villas available too. We had been before for my birthday in 2015, the hotel featured in my top three spa hotels in the UK. This time we treated ourselves for our mini honeymoon to the Estuary View with Balcony room. It was stunning. Nautical themed of course with breathtaking views over the estuary. One real treat with having a balcony room was that it was warm enough to sleep with the balcony doors open and the curtains shut. I could hear the water lapping and the yachts going to and fro in the early morning tide but without being woken too early by the sunlight. I love being by water. It was very peaceful and quiet in this part of the hotel and our room, ask for 508, it had a great view. 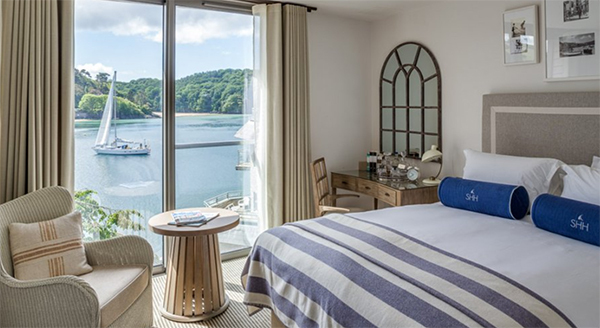 The Estuary View with Balcony room is a spacious double with a private balcony and panoramic estuary views. Plus there are complimentary decanters of Gin and Sherry in every room so you can sit back with a drink in one hand and watch the world go by on the estuary. I love that there is a ‘balcony basket’ with a blanket (useful for the UK weather), slippers, books to read and binoculars. You get complimentary use of the Harbour Spa. It is lovely and the pool is great, but it is indoors so if you want to sunbathe you need to do this on the deck near the restaurant and bar. They have lots of comfortable loungers. Back to the spa, its a lovely place for pampering and tranquility. As long as you don’t arrive like we did, during Aqua aerobics when the drum and bass was playing. I recommend asking when the classes are on as this changes depending on season. Also if you don’t have any children then avoid children pool time as these can get a bit noisy and crazy! There’s a lovely swimming pool, sauna and jacuzzi bath and great cabanas along the side of the pool to relax in. 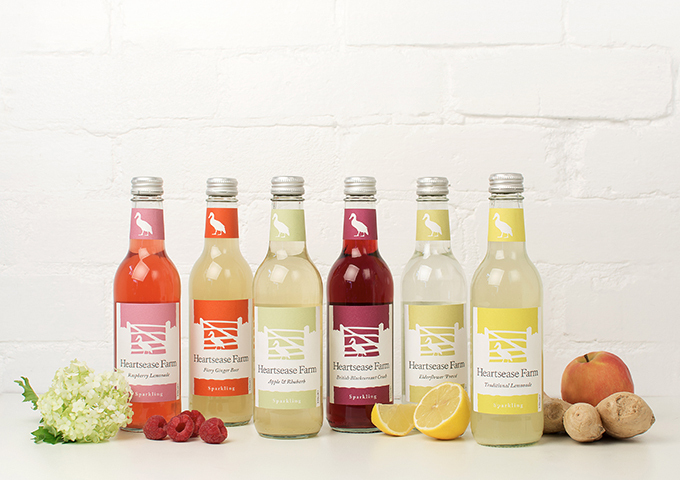 I particularly like the Kilner jars with ice cold water with lemon, cucumber or natural to keep you hydrated. Plus there is an awesome “Pebble Room” for ultimate relaxation. There are a range of Espa treatments you can enjoy within the five treatment rooms. 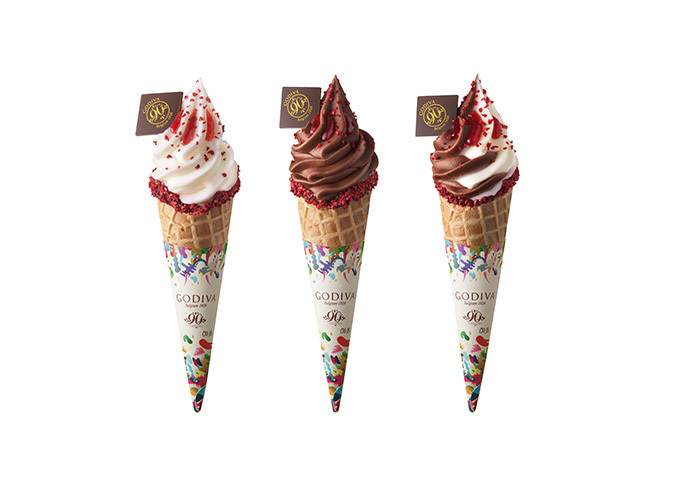 I have never tried one here but I know from previous experience that they are great. There are some treatments unique to the Harbour Spa so make sure you ask about these. The hotel restaurant, The Jetty, has a great dinner menu. Naturally there is a lot of local fish on offer. The restaurant celebrates local flavours and and in season has a famous Crustacean Bar. But for me the winner is the breakfast! A fabulous range cereals, fruit, nuts and yoghurt plus pastries. Which can be followed by a superb choice of cooked breakfast, that was always yummy. Set yourself up for the day with a great breakfast in the dining room overlooking the estuary. 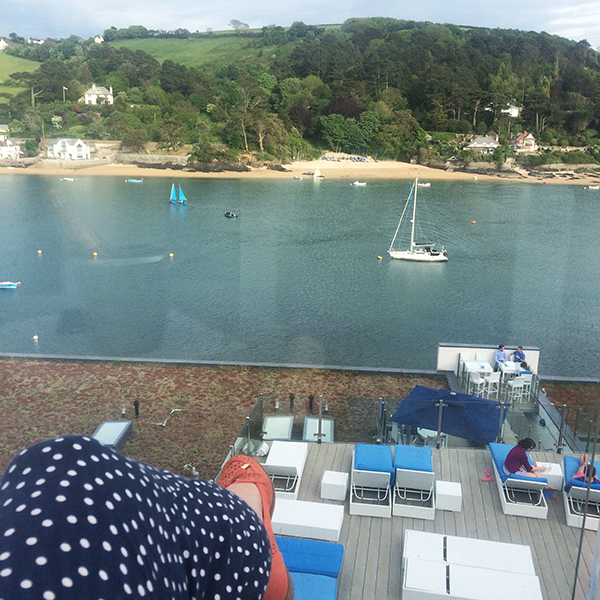 A week after we returned home we saw that Sir Rod Stewart and Penny Lancaster stayed at the Salcombe Harbour Hotel, so we must have started a trend! It’s a fabulous place in a gorgeous area of Great Britain. 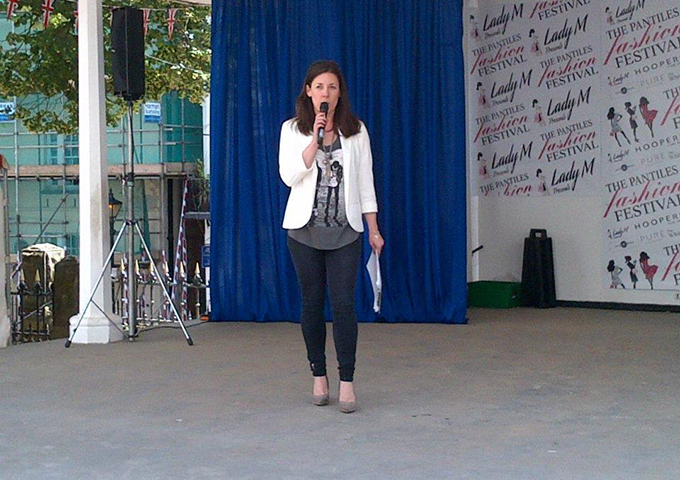 You can read up on my style guide session with What To Wear to Salcombe. Let me know your favourite places in the area. Any top tips on great shops, good pubs, fun things to do?